There are many reasons why a water system can become contaminated with pathogens such as Legionella or Pseudomonas. It is likely that the pathogens are already in any water system, but at low concentrations where they will not have any effect on health. Problems arise when the pathogens are able to reach high concentrations and where there is also an exposure route. The reasons that contamination occurs in the pipework can include water temperatures, over-sized pipework (or other installation mistakes), long travel distances, long stagnation phases, short circuits in the cold water/warm water system, dead legs, not enough thermal disinfection, retrograde contamination or simply a growing bio-film colony in the hot and cold water systems. The age of the system is one of the less important factors, though the older the system the higher the chance for dead legs and areas of stagnation. In addition the piping materials have an influence on the speed and extent of bacterial colonisation i.e. iron is a source of nutrients for bacteria and is a good growing medium for biofilm, copper is mildly phytotoxic and plastic makes a good base for biofilm. In the case of biofilm, it forms in places with a high count of different micro-organisms (bacteria, fungi, eukaryotes), which settle and bond to surfaces that are wet (for example pipes and boilers). These micro-organisms are usually covered by a film of mucous substance, that are produced by the micro-organisms, these are embedded together and fixed at the surfaces (think of the slime feel in some hot tubs or pools). The mucous substances, which can form up to 90 % of the biofilm, contain other diluted and particulated products (for example corrosion by-products, scale etc) which are nutrients for the organisms. 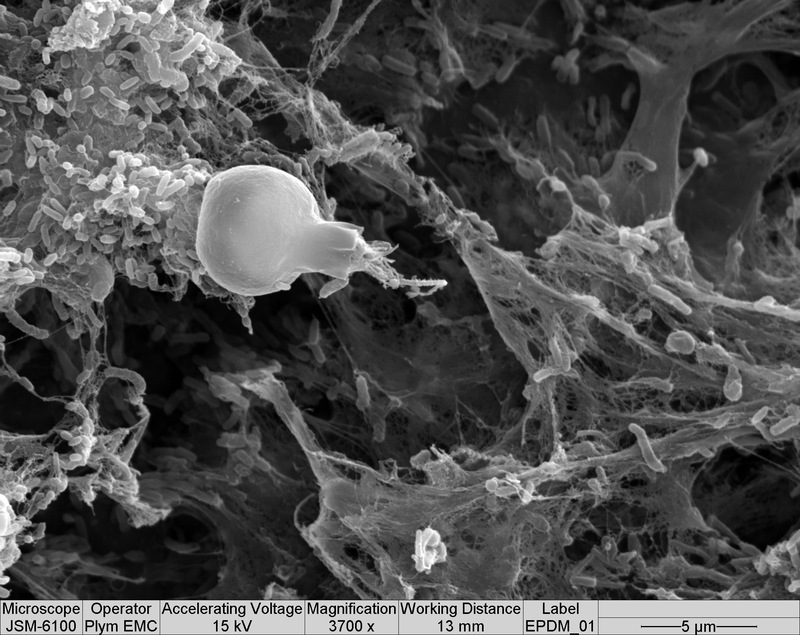 When touched, the biofilms have the feel of a thin film of slime. Biofilms are potentially a risk area for infections, because in general bacteria find biofilms an ideal breeding ground. Water treatment can only ever be fully successful if the treatment method used either reduces biofilm or prevents its build up. If you can take away the breeding ground for the micro-organisms on a continuous basis then you can increase the overall hygiene of the water. It is worth noting that Legionella does not form a primary biofilm, it colonises areas where a biofilm already exists. Drinking water is not sterile and should not be. In general the water suppliers deliver a very stable drinking water this is largely due to due to the low nutritional content of the water, the water therefore generally passes the microbiologic requirements for drinking water. Nevertheless bacteria often enter into a domestic installation. When the bacteria find nutrition in the domestic installation, then they can occupy the wet surfaces and lead to a build up of biofilm. The extent of a biofilm build up is influenced by various factors. The biological nutriton content and the water temperatures are the deciding factors. With an increase in the nutritional content and an increase in water temperature the biofilm build up increases. The intensity of the biofilm is also dependent of the pipe material and their age. Some new polymer pipes can contain biologically usable additives like softener, anti-oxidation materials and release agents, which can serve as a nutritional source. On new materials you can have biofilm a build up in one to two weeks, and after a few more weeks you reach a quasi steady state. Source: BMBF (Bundesministerium für Bildung und Forschung) Contamination in cold water systems. If biofilm is present then it is impossible to have a microbially hygienic water system. The Aquadron treats all of the water that passes through the system, it does this by proportionally dosing all of the water with Anolyte, 24 hours a day, seven days a week. The Anolyte passes through the whole system, removing biofilm and killing bacteria, it even works in the shower heads and taps, at a point that is beyond the thermal mixing valves and that is not protected by thermal treatment. This ensures that bacterial colonies can not form in the pipework system.